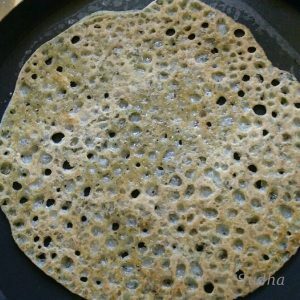 Ghavan is Konkan style instant rice Dosa (Crepe) that does not require any fermentation. Kasuri Methi is not used in Konkan. But I thought Kasuri methi added to Ghavan would taste nice; so tried it. It came out very tasty. You can make this quick, tasty and healthy dish for Breakfast / evening Snack. This is fusion recipe of North and West India. 1. Dry roast Kasuri methi for a few minutes till crispy. Crush it using hands and Mix it with Rice Atta, Garlic pieces and salt. 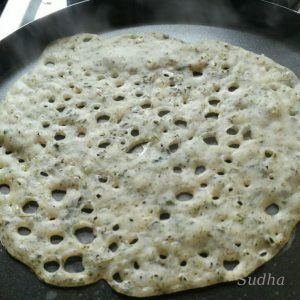 Add water to make mixture of consistency thiner than dosa / crepe batter. Batter should be very watery. 2. Heat non stick flat Griddle (Tava). Change gas to medium flame. Do not sprinkle water. Griddle should be hot. 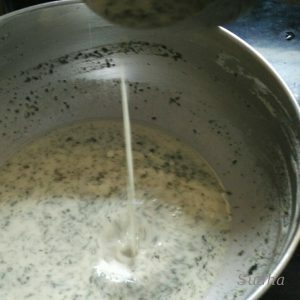 Take a small cup full of batter and pour it on Tava to form a thin layer. 4. Remove the lid. 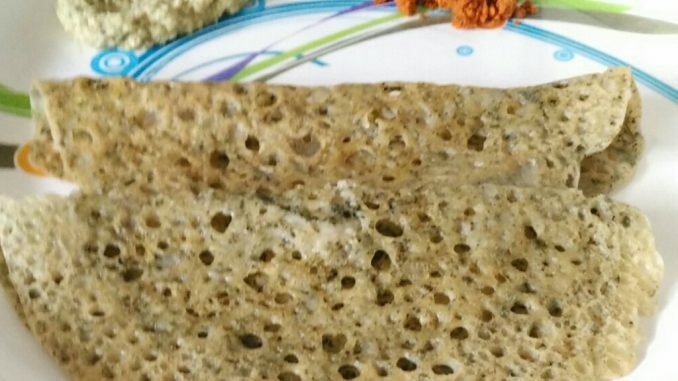 You should not see any wet batter on the front side of Ghavan. If you do, then cook further. Put 2 drops of ghee / clarified butter on front side and spread over Ghavan. It is better not to put ghee on griddle as it gets burnt and wasted. It is always better to spread it on Ghavan. 5. Flip the Ghavan to cook the other side. The side that it on the top, you will see nice mesh (Jaali). This means it’s perfect Ghavan. Now don’t cover it. Spread 2 drops of ghee on the side on top as well. It takes 2 minutes to cook. On the side that is touching griddle, you should see small light brown dots. Then it’s done. You can lift it a bit from a side and check. 6. 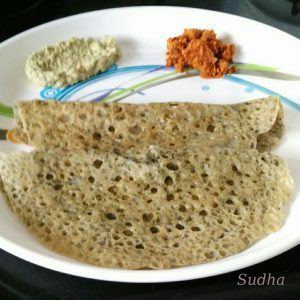 Serve with Home made butter and/or Peanut Chutney or any other chutney. It taste nice without any chutney also.